This is certainly not the first time we have featured Desenio on a Wednesday, but we just love them. If you want modern, on-trend and quirky prints then look no further. 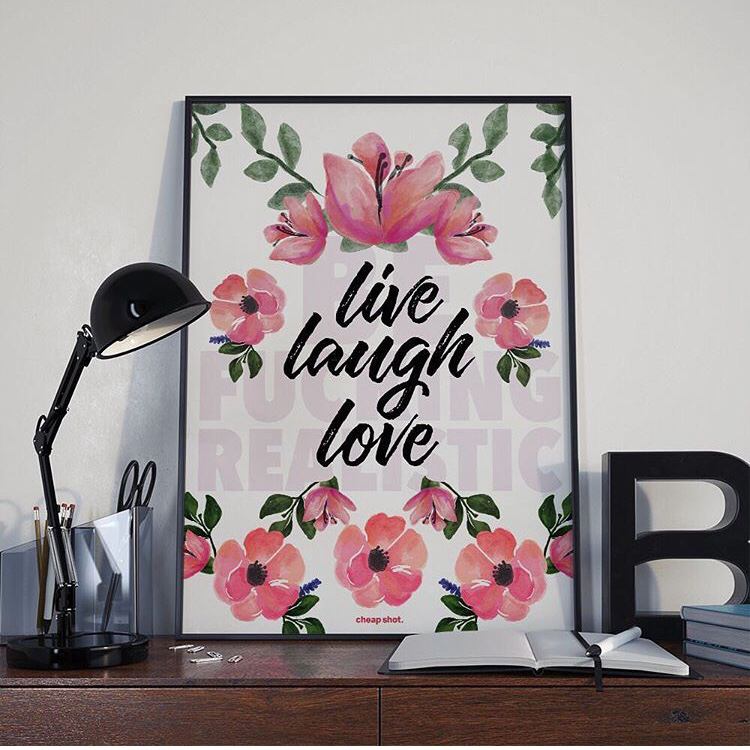 Their new collection features monochrome typography, digital portraits, florals, fruits, and geometric designs, all in shades of pink, green and blue ( as well as black & white ). A gorgeous collection to pick from. The range is huge so you will be sure to find something, and with prices starting from under a fiver its not going to break the bank. We must congratulate the folks at CheapShot for succeeding with their crowd funding to launch their creative (and wittily sarcastic) new print brand. Their prints (and cards) are on the surface a pretty mix of flora and typography with a meaningful quote but look a little closer and realise the amusing full design of the ﻿prints with their witty undertone cleverly and discreetly written behind the main quote. It’s genius, well priced and perfect to adorn your walls. Head to their Instagram feed now to find out more! Floral prints are always a popular choice, especially around this time of year. Spring brings flowers and colour which in turn brings joy and positivity into our lives. This is then replicated in the home with our interior choices. This year its the same, although now the prints are bolder, bigger and more colourful. Florals have often felt quite old fashioned and it can be difficult to know how to use them in the home. A great place to start is with soft furnishings; cushions and rugs in a distictive pattern mixed with more plain colours help bring this trend in a subtle way. Mix different floral prints together for a bolder look or with other patterns like stripes and geometric [ see previous trend post floral x geo ]. Large floral images look great framed as pieces of art, and just having a few of these around the home or placed together on a wall can create a subtle nod or full on statement to this trend. Go even more bold with a mural wallpaper or an allover patterned sofa. The wall becomes a piece of art on a larger scale and can bing drama to a room and a floral sofa is fun and quirky, making all your guests smile when they enter the room. Go one step further and match your sofa with the wallpaper, for a full on statement. However much floral you fancy investing in, remember it can be young and cool and no longer Mumsy, so enjoy it.